Call today to book our wedding venue! The City Club of San Francisco is a private business and social club in the heart of the Financial District. This elegant building makes for a perfect event space or wedding venue. Within The City Club, you will find a world-class private dining area with a number of rooms for business and social functions that host up to 500 guests. When you are searching for the perfect place to book your next event, think of us. As one of the premier sites in San Francisco, CA for hosting networking events, The City Club of San Francisco maintains a reputation for tasteful elegance. Whether you're looking for a memorable wedding venue or a place to host parties or corporate events, our facilities are built to impress. Book your corporate events at our club. If you're looking for a place to host a party, corporate event or a wedding, The City Club of San Francisco is the perfect solution. Featuring catering and bar service, personalized seasonal menus, and all table services, we have everything you need to throw an unforgettable event right here on the premises. Our stunning interiors and versatile event space makes us suitable for any kind of wedding, celebration, or networking event. Members enjoy world-class cuisine, lively corporate events, effective business networking events, and access to over 200 private clubs world-wide. Whether you are new in town, looking to expand your network, or need an upscale wedding venue, the Club is a welcoming retreat and convenient event resource. Our elegant club quarters are ideal for business luncheons or impromptu meetings. Membership opportunities are available and inquiries are welcome. Public transportation, validated parking, and most downtown offices are easily accessible from our location. The history of The City Club is what makes this building so special. It was first built in 1928 as the Pacific Stock Exchange Luncheon Club. The Art-Deco Clubhouse is modern in feel and creates a lasting impression. Imagine taking your wedding pictures in front of brass, marble, and stone artwork, and designs from the Prohibition area. In every room there is a grandiose view of the city. A wedding venue to remember. In order to host a larger gathering such as business or corporate events, you should be able to accommodate many people. The City Club of San Francisco has a stunning facility that can seat well over one hundred people. You'll be able to dine with our specialty catering services that will surely impress your boss or employees! The City Club's stylish Art Deco interiors present a dramatic setting for your next corporate event, and our award-winning Executive Chef is dedicated to providing the creative, market-fresh cuisine, catered specifically to your tastes. Our experienced catering team provides professional, responsive service, and our full-time banquet staff is committed to ensuring that your corporate events run smoothly. Networking is one of the most important ways to excel at business. Plan your next networking event at The City Club. The atmosphere is sure to spark wonderful ideas and intellectual exchanges with your business associates. Our historical San Francisco location features 5 rooms capable of hosting anywhere from 12 (Pflueger Room) to 250 (Main Dining Room & City Club Café) occupants. The City Club of San Francisco the perfect location to make new connections at networking events and meet and greet important clientele in the San Francisco, CA area. The City Club of San Francisco invites you to take a tour of our event space. You'll find that it is perfect for a wedding venue reception and a place to hold corporate events for your business. When holding an event, you need to make sure the space is atmospheric and inspiring. You will find this here at The City Club. We look forward to hosting your networking events in the future! 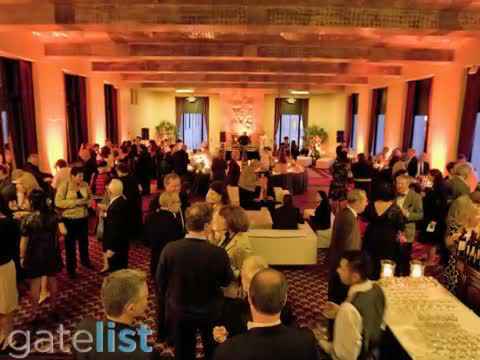 The City Club of San Francisco provides an upscale location for hosting a multitude of events, specializing in corporate events, networking events, and wedding receptions. We also provide an excellent menu and space for dinner parties and banquets. Monday ï¿½ Friday, 7:30 AM ï¿½ 8 PM for members. For private events, please call to inquire.